Horace Leon Lamberth passed away in Melbourne, Florida on Friday, July 31, 2009 due to complications from cancer treatment. Horace, the youngest of six children, was born November 18, 1933 to Edie and Clayton Lamberth. Peggy Janette (Hornberger) Lamberth passed away in Orlando, Florida on December 14th, 2017 due to complications associated with dementia. Peggy, the youngest of two children, was born September 18th, 1935 to Eugene and Zelda Nadine (Link) Hornberger. 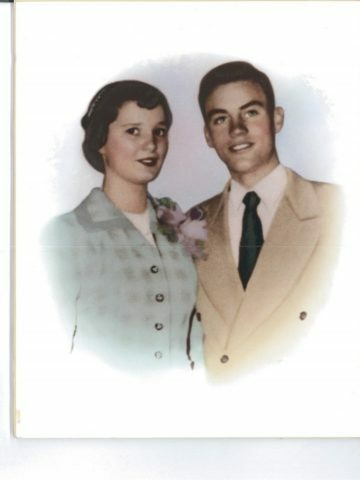 Horace and Peggy were married on December 19, 1952 at the ages of 19 and 17 respectively. They originally met when Peggy was in the 1st grade and Horace was in 3rd grade. They were married for 56 years. They are survived by her two daughters, Marcia Hannan and Karen Fields, as well as five grandchildren; Leslie, Aaron, Zachary, Rachel, and Taylor, and one granddaughter-in-law, Elia. Horace graduated from Tennessee Tech in 1960 with a Bachelor of Science degree in Mechanical Engineering. He then moved his family to Satellite Beach, FL where his extraordinary career began at Kennedy Space Center. By 1984, he had risen to Director of Shuttle Engineering. After his retirement from NASA in 1986, his love for the space industry prompted him to begin a career at Lockheed Martin. In 1990, he became Vice President and Chief Engineer. He retired from Lockheed in 1997. For eleven years following his retirement, he was served as a consultant to the United Space Alliance, NASA, and Lockheed. He was honored with the National Space Club Lifetime Achievement Award in 2001. His remarkable career included several awards exemplifying his importance and dedication to the success of the space program. Upon his death, his family was presented with an American flag which had flown over the Kennedy Space Center by the director of NASA. Horace and Peggy enjoyed a deep loving relationship throughout their lives. Peggy was Horace’s biggest fan and integral to his success. Her support and contribution to his career was recognized by colleagues at both NASA and Lockheed. Peggy was a loving homemaker and mother. Her home was a favorite place for her children and grandchildren to visit; famous for her key lime pie, fried chicken, boiled custard, homemade meals and sweet tea. Both Peggy and Horace were avid golfers, having lived on the golf course at Suntree for 20 years. They enjoyed many deep and lasting friendships at Suntree. Both proudly displayed their hole-in-one plagues and their garage was full of golf paraphernalia. Peggy was a star basketball player and cheerleader at Whitehouse High School. Whenever the family played “Horse”, you always wanted to be on Peggy’s team! A celebration of their lives, hosted by their daughters, will be on Saturday June 7, 2018 at 1pm at Cole & Garrett Funeral Home, White House, with visitation from 12pm until service time. Interment of their urns will follow at Hillcrest Cemetery. Afterwards, all are invited back to Cole & Garrett for light refreshments and additional reminiscing about these two wonderful and loving individuals. Thank you Roger. We missed you at today’s service but got to spend time with your beautiful Amanda. We love and miss you. Come to Florida and/or Colorado soon! !